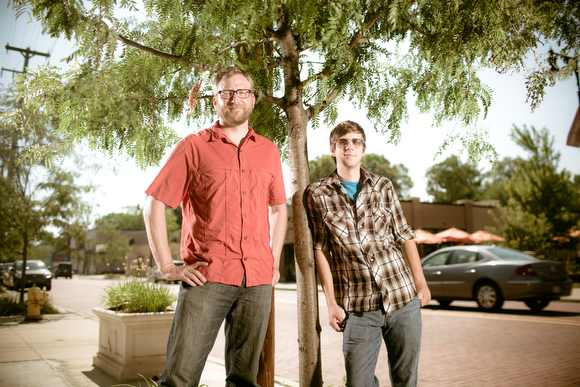 Steve Faber and Lee Mueller want to change how people interact with Trees. The Urban Forest Project is a new initiative of Friends of Grand Rapids Parks, operating in partnership with the City of Grand Rapids and the Grand Rapids Urban Forestry Committee. The Grand Rapids Community Foundation provided funding to launch the project in December with a $253,825 grant to be spread out over two years. This question acted as the inspiration for the Urban Forest Project. The goal is to engage the community in growing a larger, healthier urban forest, which is defined as the connected system of trees throughout an urban environment. No tree is isolated from another, but joined together as part of one ecosystem. This spring, the City of Grand Rapids spent $200,000 planting nearly 800 trees in an effort to increase the urban canopy, the layer of trees visible from above. It’s estimated that the tree canopy in Grand Rapids covers roughly 30% of the city. A goal has been set to increase the canopy to 40% by the year 2020. In order to achieve this, an additional 200,000 trees will need to be planted. The three main aspects of the Urban Forest Project will be an interactive citizen tree map, an online web resource center and community engagement and education. Friends of Grand Rapids Parks hired Lee Mueller in May to serve as the coordinator of the project. He most recently worked for the Greening of Detroit managing large-scale green infrastructure projects, including tree plantings. Mueller holds degrees in forestry from Michigan State and is an International Society of Arboriculture certified arborist and a State of Michigan registered forester. The interactive citizen tree map on the Urban Forest Project’s website operates on a customized version of Azavea’s OpenTreeMap software. Users will be able to add trees to the map’s database by entering the type of tree and its location. When the dimension is also added, the software will provide a dollar value of the tree’s annual ecosystem services. Grand Rapids is the fifth city in the country to use this tree-mapping program. It’s also the smallest city to use it, and the first in the Midwest. Between active partners like the City of Grand Rapids, the East Hills Council of Neighbors, Calvin College, Aquinas College and others, there are currently 17,000 Grand Rapids trees already mapped and stored in a database. With the estimated 1.5 million trees in the city, this amounts to only slightly more than one percent already mapped; yet Mueller is not concerned. “I donât look at it as a goal to get every tree mapped, but to get people to interact with their urban forest and to understand the benefits trees provide,” he says. Data from the site is for everyone and can be downloaded for reports or presentations to classrooms, neighborhood associations, committees and other groups. “People might use it for really unusual things and that’s good,” adds Faber. The three main benefits in having a citizen tree map in Grand Rapids is that it will become a good way for people to interact with the urban forest on a basic level, it will alert us to potential issues with our trees like a new invasive pest outbreak or drought conditions and, finally, it will serve as an advocacy tool for saving and supporting trees. The website resource center and the tree map are expected to be online before the end of July. The third part of the Urban Forest Project focuses on community engagement and educational opportunities. The group will soon be offering mini grants as one component in this area. Funded by the Grand Rapids Community Foundation’s two-year grant, these mini grants will be given to individuals and businesses for tree-related activities up to $500, or for a certain number of trees planted on public property. Applications can be found online starting in August with 10 grants to be awarded this fall to coincide with October NeighborWoods month, which is a month-long national celebration of trees supported by the Alliance for Community Trees. Mueller says he plans on mapping all of the trees planted by Friends of Grand Rapids Parks and hopes that others will soon start mapping the trees in their yards, parks and parkways. The Urban Forest Project will offer its first tree-mapping workshop on August 9 at the East Hills Neighborhood Association building at Cherry Park. Anyone can participate, but Mueller encourages other neighborhoods to host their own workshops as well. If you want to meet Mueller or find out more about the project, a good opportunity would be the annual Friends of Grand Rapids Parks fundraiser, the Green Gala, on August 23. Faber and Mueller are curious to find out how the community will interact with the Urban Forest Project. If nothing else, they anticipate that it will provide a greater awareness of the benefits trees provide and inspire people to plant more. Steve Faber, left, and Lee Mueller, want to change how people interact with Trees.